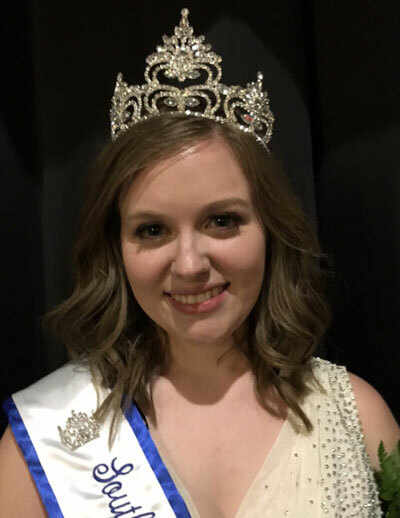 Krista Harringa, an 18-year-old South Dakota State University (SDSU) student from Brandt, was crowned South Dakota Dairy Princess during the opening of the Central Plains Dairy Expo March 28 in Sioux Falls. Harringa is the 62nd woman to hold the title representing South Dakota’s dairy farm families. Harringa is the daughter of Royce and Kim Harringa and studies agriculture communications. She is assistant superintendent of the dairy judging contest at SDSU, and a member of the Dairy Club and Sigma Alpha. The new princess will spend the next year helping to share the story of dairy farming and dairy’s role in healthy diets with people across the state. Named runner-up was Stephanie Ponto, 18, daughter of Steven and Vonda Ponto of Watertown. Ponto is a senior at Deuel High School and plans to attend Lake Area Technical Institute majoring in agribusiness. Harringa and Ponto were chosen from among four contestants for the title. The winner receives a $1,000 scholarship from Midwest Dairy Association’s South Dakota Division, which sponsors the dairy princess program, while the runner-up receives a $500 award from Central Plains Dairy Expo. The South Dakota Dairy Princess is selected based on her general dairy knowledge and enthusiasm for the industry, communications skills and ability to reach consumer audiences. Midwest Dairy Association® is a nonprofit organization funded by dairy farmers to foster innovation and inspire consumer confidence in dairy products and practices. Midwest Dairy is funded by checkoff dollars from dairy farmers in a 10-state region, including Minnesota, North Dakota, South Dakota, Nebraska, Iowa, Illinois, Missouri, Kansas, Arkansas and eastern Oklahoma. For more information, visit MidwestDairy.com. Follow us on Twitter and find us on Facebook at Midwest Dairy.